Here are saddles, bridles, and other tack that I recommend based on my experience using them. If you click on the pictures, you will be taken to Amazon.com where you can find out more about the item and purchase it. I'm an Amazon associate, so I receive a small fee for linking to the product here, but the items are chosen only because I've used them and feel comfortable recommending them. OK, I admit this as well: I have custom made saddles. Again, they have lasted for years, fit me well, and fit most of the horses I've ridden well, too. But in the meantime, here is a saddle I recommend based on feedback from people I trust. 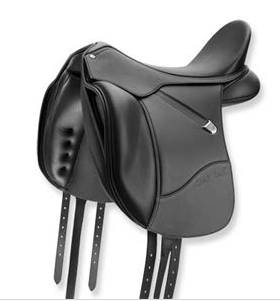 It is the Bates Isabell Classic saddle, which has the deep seat most suited to female pelvises. You can find it at Dressage Extensions. I have not used a Micklem bridle, but I decided to include one here because I have heard good things about them from people who switched to this type of bridle, and social media discussions at reputable dressage websites are full of people singing their praises. OK, I admit it: I only have Stubben bridles, and I've had them for years. But they are very hard to find and very expensive. Here is one from Dover Saddlery. Meanwhile, this is a pretty nice bridle that is reasonably priced. These hinged stirrups will help you develop the balance you need to prevent your feet from sliding "home". The hinge allows your ankle to flex, which also helps keep your leg steady as the horse's barrel expands, contracts, and swings when he breathes and moves. A lower-cost alternative to the very popular Pessoa system. This system can really help horses with less than perfect conformation develop their musculature properly. I've ridden many different breeds of horses, and I've found that for warmbloods just generally have an easier time at dressage and jumping because of the way they are built. Other horses can excel to the extent that they have warmblood conformation. Horses with this warmblood conformation find it easier to collect. But that doesn't mean horses that don't have ideal conformation can't compete successfully in these sports. They can. But we need to put a little more thought and a little more effort into helping them develop the kind of frames and musculature they will need to do the job. Here is a great article by Dr. Hilary Clayton on the biomechanics of different breeds. ​Side reins are another way of helping a horse develop a strong topline and frame. I like this style because you can adjust them easily using the d-rings on the reins themselves (rather than having to buckle and unbuckle the reins as in other systems). I also like that they have elastic built into them so they "give" a little, which is more forgiving on the horse's mouth. ​There are lots of longe lines on the market. I have had this kind for over twenty years, and it is still in perfect shape. ​This ingenious strap keeps your stirrups from sliding down and banging on your horse's barrel when you longe your horse saddled. No need to tie up your stirrups. ​Jeweled spur straps..because sometimes you just want a bit of bling. Very classy, nice weight and finish, a bit more expensive. In my experience, these are hands-down the best bits. The "lozenge" style is perfect for starting horses or for any level of riding that does not require a double bridle. They last forever; I've had some of mine for over twenty years. To see the variety of styles at Amazon, CLICK THE LINK BELOW THE PICTURE. ​I like these saddle pads because they are thicker than most of the ones on the market. They last a long time, and wash clean. They come in both dressage and general purpose length. ​If you are having trouble developing an elastic feel in your rein contact, do yourself and your horse a HUGE favor: Use this rein aid endorsed by Hilda Gurney. It is ingenious. When you take a normal contact, the elastic allows the reins to have a bit of "give", which is more forgiving on the horse's mouth. But if you need a strong "whoa", you just pull the reins as you normally would, the elastic stretches to its full length which puts you back on the firm leather part of the rein aid. Highly recommended! You can get it from Dressage Extensions. ​Pretty good quality at an affordable price. These get rave reviews from most people who try them. They look a little funny at the buckle end because they are riveted. But that's their selling point: They are designed to lie flat on the saddle, not bunched up under your thigh. 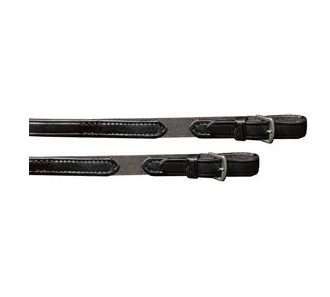 Nice, thick, padded leather halter that can be fully adjusted to fit your horse. Buckles on both sides of the headpiece, on the cavesson, and throat latch. Throat latch is rolled for comfort. I like Cashel fly masks because they fit better. They are designed to snugly fit the contours of a horse's head, which keeps the flies out. There is nothing more irritating to a horse than a fly that manages to get under a floppy fly mask and buzz around in there.